08-31-2013 Alaskan Dream Cruise is an Alaskan vacation dream come true. It is hard to imagine a Southeast Alaska cruise vacation that could be more fun than our 11 day cruise on the Alaskan Dream. 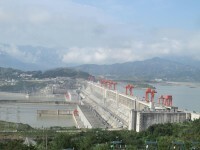 The mass of the water behind the Three Gorges dam in China changed the moment of inertia of the Earth to the extent it increased the length of a day by 0.06ms. The position of the poles also changed by approximately 2cm.